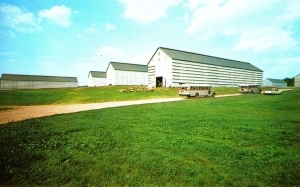 Description: Color postcard showing a cluster of whitewashed tobacco sheds. Shade grown tobacco used for cigar wrappers is grown in a wide area of the Connecticut River Valley in Massachusetts and Connecticut known as Tobacco Valley. Louvers on the sides of the sheds are opened and closed to regulate the drying and curing of the tobacco leaves. School buses are frequently used to transport the farm laborers to and from the fields.